Aquarian's ground breaking inHEAD blurs the line between acoustic and electronic drums. Like all heads, it will eventually wear out but individual inHEADS can be purchased separately in a variety of sizes. Amazing sensitivity and dynamic response. Performs well as a normal head. Needs a powerful drum module to get the most out of it. Several years in the making, Aquarian's inHEAD combines an acoustic head and electronic trigger in one ground-breaking package. The inHEAD reviewed here is part of a start-up kit that also contains a rimSHOT (second snare trigger) and kickZONE (bass drum trigger) along with an inBOX and requisite leads. Triggers are sensors that translate movement from a drum's shell into electrical signals. These are sent to a brain (a module or drum machine) to be processed, providing an acoustic kit with a vastly expanded palette of sounds and textures. "In developing the inHEAD, Aquarian has abandoned vibration-led triggering and developed a new pressure-sensitive system"
Conventional triggers usually clamp onto the rim of a drum; as they are designed to respond to vibrations a common problem is misfiring - accidental triggering (and also non-triggering). Accurate interpreting of variations in playing dynamics can also prove difficult. In developing the inHEAD, Aquarian has abandoned vibration-led triggering altogether, and developed a new pressure-sensitive system that utilises Force Sensing Resistor technology. Additionally, rather than having a single point of contact (as with existing triggers) the FSR is encased inside a real drumhead and can be triggered from any area across it. Aquarian, being a head manufacturer, has ensured that the inHEAD also functions as a conventional head. The inHEAD is made up of three plies of clear film with the FSR sandwiched inbetween. The FSR takes the form of a series of evenly-spaced circles flowing ripple-like from the centre of the head to around 5mm from the edge, not unlike tight bands of cymbal lathing. They are not quite complete circles as they start and end in a single radial spoke that travels from the centre to the edge where the output cable is located under the flesh hoop. This terminates in a mini-jack which plugs into the supplied inBOX, a preamp/power source that slots into a quick-release mount fixed to one of the tension rods. 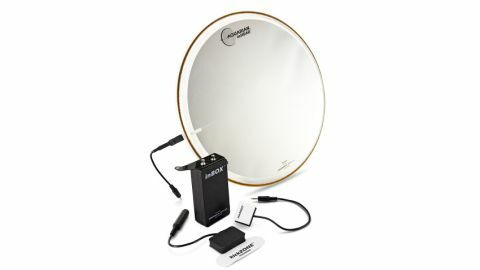 "Considering what's inside it, the inHEAD makes a surprisingly good regular head, sounding sharp and pretty full-bodied"
The rimSHOT and kickZONE resemble more conventional triggers, with the rimSHOT clamping directly to the snare hoop while the kickZONE has a self-adhesive backing that sticks it directly onto the bass drum head. The rimSHOT has a mini-jack that also plugs into the inbox; the kickZONE is outputted separately via a 1⁄4" jack socket. Considering what's inside it, the inHEAD makes a surprisingly good regular head. We fitted it to a steel 14"x6" snare and were expecting it to be acoustically compromised. But instead of being of boxy and stifled it sounded sharp and pretty full-bodied, with a little ring present but nothing too grating. In terms of playability, it feels and sounds eerily close to a normal head. Once plugged in it's clear that its sensitivity and accuracy is a giant leap in comparison with existing triggering solutions. It tracks from brushes upwards, taking double strokes and buzz rolls in its stride. In fact, the drum module we were using struggled to keep up with the speed and variations in dynamics that were being sent to it. A powerful and flexible brain is therefore an absolute must in order to realise the full potential of the inHEAD. The rimSHOT and kickZONE triggers prove equally capable. While not being called upon to capture such a spread of dynamics, they perform faultlessly and with unwavering clarity. The response was so fast and true that we tried recording the kick and snare simultaneously as acoustic and triggered drums. On playback it was possible to mix the channels in any pairings (acoustic kick with triggered snare, acoustic snare with triggered rim, etc) with seamless results - no lag or misfiring issues, it was all right on the money. While fine-tuning the sensitivity it was even possible to induce a faint response from the inHEAD without striking it - a stroke from the kick drum was enough to provoke a shiver similar to that of snare wires rattling in acoustic sympathy. This remarkable feat had this reviewer and the sound engineer smiling in amazement.